Carnival Eats will be filming at the Strawberry Festival for appearances on two episodes in season six. It’s official: the Florida Strawberry Festival is a destination for foodies of all kinds, from patrons to vendors and, soon, national TV. Carnival Eats, one of the Cooking Channel’s most popular shows, will be stopping by the Strawberry Festival this year as it films its sixth season. And, not to be outdone, the show’s producers are planning to feature Plant City’s annual end-of-harvest celebration over two episodes. “For us to get two episodes of food, it has to be a big festival with a really great variety of stuff,” Jennifer Horvath, the show’s executive producer, said. The show will feature about eight items, many of them strawberry-themed exclusives from a variety of vendors, though Horvath said the exact items haven’t been picked out yet. Mama Jane’s Loaded Fried Potato Funnel Cake. 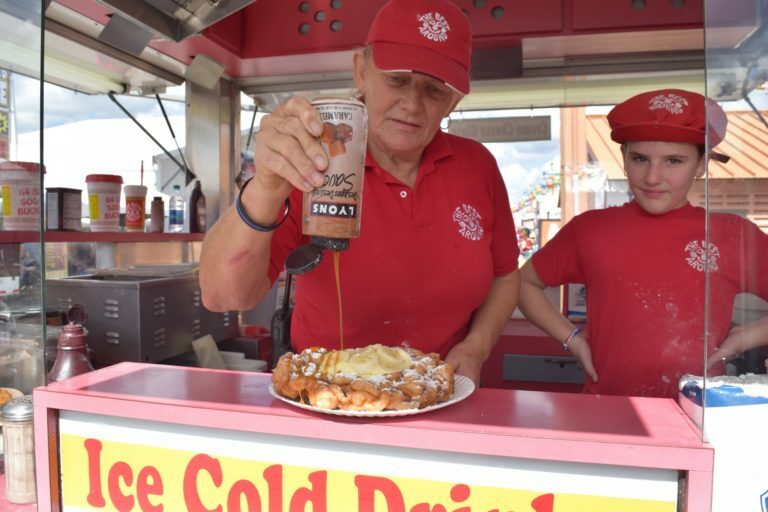 One of the concessioners that’s sure to be seen on the show is Mama Jane Harris of Best Around Concessions and her famous funnel cakes. Each year, Harris brings a new and unique item to the Strawberry Festival. Last year, it was deep-fried strawberry cheese bursts. This year, she’s making loaded fried potato funnel cake, which features a batter mixed with bacon bits, chives and potatoes that is fried and topped with hot cheddar, more bacon, chives and sour cream. The appearance will be Mama Jane’s third on the show. Horvath said she’s become someone who’s creative approach the show looks out for. Harris is even preparing a cookbook featuring some of her most creative, crunchy creations. According to Lauren McNair, the festival’s spokesperson, Seafood Cabana, Griff’s Catering, Sunshine Concessions, Johnson’s Barbecue and Polar Bear Homemade Ice Cream are also expected to appear on the show. Jennifer Gillespie, a story producer with Carnival Eats, said the show looks for festivals with a variety of interesting foods from the sweet to the savory and, especially, the unique. They also try to find places with a strong community tie. Ryan Hagy of DeAnna’s Food Concessions prepares a surf and turf sundae. It features fries, cheese sauce, bacon and sour cream, topped with steak and shrimp. Hagy’s unique, family-run food stand is a Strawberry fest hopeful. The festival’s attention and reputation are also attracting more vendors each year. Paul Davis, the festival’s president, said some 500 vendors have to get turned down every year. Not only does the festival look for good food, it looks for vendors that capture the family-friendly spirit he hopes the festival embodies. Vendors like Ryan Hagy of DeAnna’s Food Concessions said they’d love to be involved in the future. Hay made a splash at this year’s Florida State Fair with a surf and turf “sundae.” Operating a DeAnna’s stand with his wife and other family members, his savory, ice cream-free sundaes were chosen as a top food item at this year’s fair. There’s also a deep-fried strawberry shortcake Davis said could be an interesting addition. DeAnna’s was also featured on a recent taping of Carnival Eats. Other interesting food items appearing at this year’s festival include Chompers, bite-sized fried balls described as “crunchy balls of goodness” that come in bacon cheeseburger and chicken parmesan varieties and a strawberry jam meatball sandwich, meatballs made with sweet strawberry jam and topped with lettuce and chives. The Plant City Lions Club’s invention, strawberry fritters, are another item putting the Festival on the foodie map. “Any time you have a fair or festival with a particular agricultural productit really encourages vendors to come up with something creative to stand out from the rest of the pack.,” Horvath said.